Hello and Welcome to GetWebInfo. Here on this post you will learn about that How To Create Sticky Floating Navigation Menu in Blogger. Are you Tired of your laborious Navigation bar and would desire to refurbish it with something that could amuse your visitor? Navigation bar is deliberated as the core element of a website because it represents the complete outlook of a website. Navigation bar has most prominent information about that helps users to navigate throughout the website. As we all are well aware that Navigation bar appears at the top of a website. It is extremely frustrating when we have to scroll back to top in order to navigate to other pages. Sometimes a person gets so annoyed that without any further delay, he leaves the website. However, by adding a scrolling Navigation bar it would allow users to take a long bread and read your content without facing any problem whatsoever. 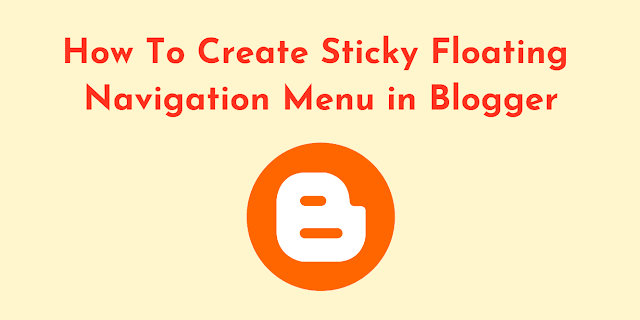 In Order to implement this tutorial there is no need to learn anything just follow these simple and easy steps and you can be able to add sticky navigation bar in to your blogger blog. Step 03: Type from your Keyboard CTRL+F and a search box has been appeard to your blogger blog HTML side. Step 04: In the template Search Style sheet just type ]]></b:skin> tag and just above it paste the following CSS coding. To Change the color of Hover effect then from the following coding replace it with this code color #1bc4de. Step 05: Again in the template search for <body> and just below it Paste the following HTML coding. However if anyone is unable to Find <body> tag then look for <body> tag and below it paste the Following coding. Don't Forget to replace all Hashes (#) according to your desire needs. Step 06: After adding these both codes to your Blogger theme just Save your template and you can all don. If anyone has any query or difficulty then feel free to leave a comment below we would love to hear you.